Nintendo Wii U owners rejoice: The Christmas purchase of a brand new Nintendo console was not made in vane. The Kyoto company is bringing all kinds of games your way over the next eighteen months. There’s new Mario, Mario Kart, and Super Smash Bros. waiting for you at E3, but there’s also all kinds of peculiar new stuff to satisfy the serious gamer. There’s a new Yoshi inspired by Kirby’s Epic Yarn and a Fire Emblem crossover with Shin Megami Tensei. If that doesn’t tickle your fancy, Nintendo’s trying its hand at HD remakes with The Legend of Zelda: The Wind Waker. New games are all well and good, you say, but what about the Wii U itself? Even after the massive mandatory update that needs to be installed after plugging the box in, that console chugs, with long wait times for loading up a game and even navigating the menu. Nintendo says that it’s got major fixes and new functionality coming to the console this spring in addition to all those shiny new games. Two firmware updates are coming to Wii U between now and the end of summer. The first update will add the Wii U’s new Virtual Console to the eShop, bringing NES, Super Nintendo, and Game Boy Advance games to the machine, but that’s not all. Nintendo preisdent Satoru Iwata promised on Wednesday that this spring update will greatly improve loading times as well as navigation back to the console’s home screen. No more waiting for two minutes after selecting an Amazon Prime movie through Nintendo TVii. The following update in the summer promises to bring more new features to the system, but Nintendo won’t detail those until closer to release. Nintendo is also introducing another piece of major functionality this spring. Miiverse, Nintendo’s social network that so far is Wii U only, is going to be available as an app for smartphones come spring. 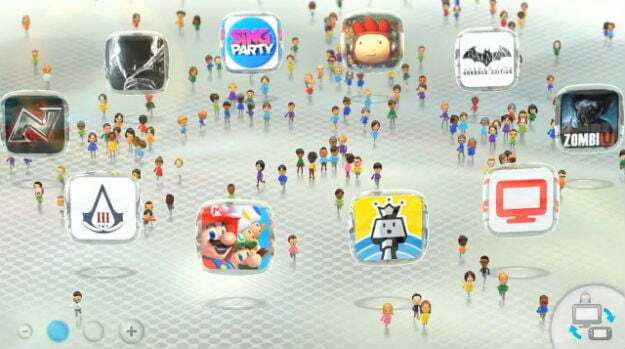 This will also introduce private communities to new games like Wii Fit U. This new app is arguably the most exciting thing about all of Nintendo’s announcements. It’s a show of growth on the part of company, a tangible example of how it’s changing the way its games interact with people’s lives. Being able to track fitness progress on a mobile device is just the sort of thing that could make Wii Fit relevant again. How many apps will BlackBerry 10 actually have at launch?